Brewed by Northern Monk Brew Co. The Refectory Series ... In collaboration with the Grub and Grog shop. 660ml bottle. Clear, mahogany colour with ruby glimmer and average, thick, creamy, moderately lasting and lacing, off-white to beige head. Fruity, herbal-spicy and minimally wheaty aroma, hints of cherry, plum, widely disguised hints of banana and clove, some nuttily malt, a minimally waxy touch. Taste is dry, nutty malty, fruity and herbal-spicy, cherry-like hints combined with black pepper, some hop bitterness. Novel, not absolutely concrete - not bad. Pours brown with a big foamy head. Aroma is very spicy, with just a hint of lemongrass. You can tell there’s parsnip used. Some peppery notes, some sweet malts. It’s not the best tbh. Bottle from Coppers, Newcastle. 660ml Bottle. Hazy dark brown in colour with a plum, pepper and parsnip (I assume) flavour followed by malt, chocolate, spices and more pepper on the spicy finish. Very nice. Tap at Erzbierschof Zurich. Muddy brown with a thick and heavy foam. 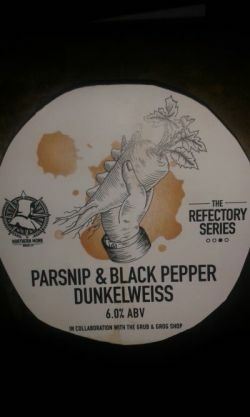 Almost no banana and yeast aroma, but clear parsnip and pepper interwoven. Dry and bitter, with a typical pepper spiciness, some sour tartness. Long bitter peppery finish. Quite rough in what it presents, but the balance is there. Good. The aroma is full of hops, banana, yeast, black pepper, caramel and wheat. The color is dark red, almost caramelish, reminiscent of cola. The taste is full of hops, banana, wheat and black pepper along with some notes of caramel. An interesting ingredient to put in a beer. I mean parsnip! It’s reminiscent of banana and it surely shines through aroma and flavour making it very natural considering this beer being a dunkelweiss. A very nice beer! Keg @ Northern Monk Refrectory, Leeds. Dark amber brown with a thin head. Sweet in character but its hops are evident. Has a tasty toffee flavour, and the toffee is found in its nose too. Bottle. Mr. Pickles, Sheffield. Hazy brown. Barely a head. Nose is pretty much what you’d expect. Sweet malts. Soft banana esters. Hint of spice. Taste is fairly sweet, with some spicy bitterness. Easy drinking, for a style I’m not overly keen on normally. Slightly bitter finish. Ok.
Bottled. Hazy coppery brown colour with a mediumsized beigeish brown head. Aroma is sweet malts, banana, some mild spices, yeast and mild toffeeish notes. Flavour is mild bananas, spices, toasted malts, some yeast as well as some mild ripe fruitiness. Smooth palate. Tap. Aroma muted in terms of spice and fruit but some malt. Appearance s copper with thin lace and some yeasty scum. Taste is sweet but more in a caramel than fruit way and there’s a lot of carbonation on the palate. This may have suffered by comparison with the excellent abbey ale that preceded it.